In particular, I think the pole of material dualism or separation can more accurately be replaced with juxtaposition. I argue that a formulation of the material conditions of physicality and digitality should be relational rather than oppositional. That is, if we understand the physical and digital to be always co-present, the question is how physical and digital relate to one another within an artifact, space, place etc. I therefore argue that we can understand these relations in terms of integration and juxtaposition. I wish to present some ideas in the spirit of collaboration that Jenny articulates. 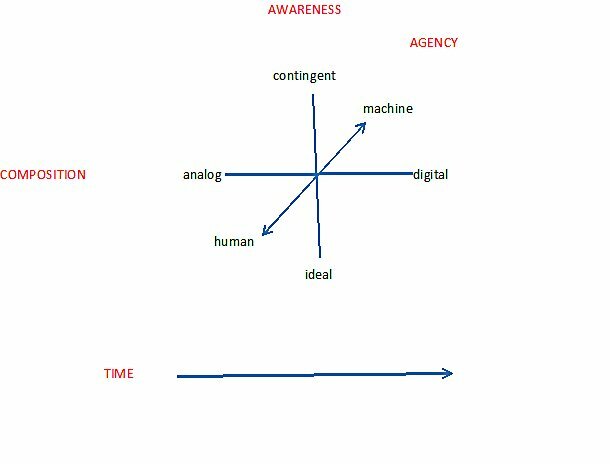 To map my largely unformed and inchoate idea of Digitism, I propose 4 dimensions, 3 spacial and time. AWARENESS representing a continuum of regarding phenomena as a progression from contingent to ideal. COMPOSITION Here the continuum is from analog to digital. It includes all elements of a functional assembly, so it in fact might be represented as a range, or discontinuous points rather than a single point. AGENCY. The spectrum ranges from machine to human. All of these dimensions need considerable expansion, maybe this more than the others. Honestly, I’m not sure where I’m going with this, so I would appreciate any reactions. I wanted to kind of just spit this out, but it’s really all I can handle cognitively right now. I have a problem with the use of these diagrams. as soon as you start drawing lines (in the sand) you separate out ‘domains’. this seems to do what you’re critiquing and is dualist in some way. I am saying this here because I think the cyborgology crew may be tired of my questions! My intention is to represent some ideas spacially as theychange over time. That’s why I note that some representations may be ranges or dscontinuous points, rather than single ponts. I don’ see how anyone has a conversation without categories,domains. As I develop my model,I hope my intentions for a dynamic approach to the domains becomes more clear, Do you have any specific suggestions along these lines. “I am saying this here because I think the cyborgology crew may be tired of my questions!” Gosh, you’re making me blush! So in terms of my problem with these ‘domains’ – facebook for example is not *just* integrational as Jenny and Nathan put it. It depends which way you’re looking at it. I am not on facebook but facebook has a kind of ‘symbolic’ presence in my life, and my understanding of social media. I think this transcends the domains you guys are using. There is also the issue that I alluded to at cyborgology of the fact a lot of these things are companies and corporations. In that sense, twitter, facebook, youtube etc function like any other corporation in the contemporary economy. So maybe they cross more than one domain.At which point the domains become blurred and overlapping.